We got a Wii U a few months ago after saving up gift cards for about a year. I like the way video games are going with more active gaming and motion! 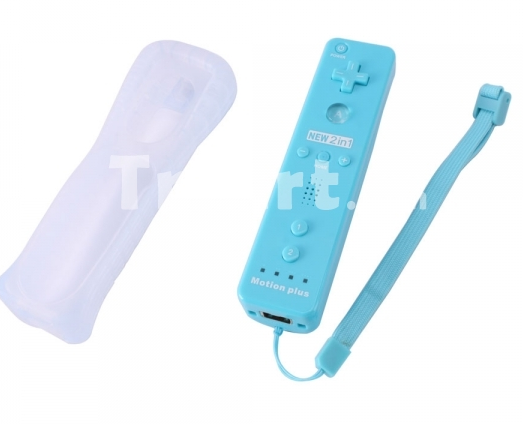 We only had one controller for a while and so for Christmas, I gave my husband the Wii U Motion Plus Controller in light blue with the matching light blue nunchuck! We received these for review from the online electronics retailer TMart, where there is always free shipping! Unfortunately, the nunchuck seems to be stuck going in one direction. But after I took that part off, the Wii U controller by itself works well. I had some problems with the controller at first, but my husband has had no problems with it, so it is probably user error on my part. What can I say, I never had a gaming system growing up! The controller looks very much like our official Wii U controller, with a few minor differences, such as the placement of the sync button. 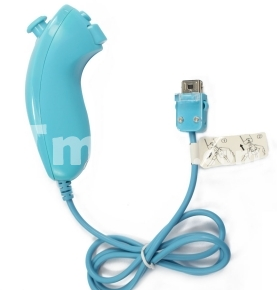 The Tmart controller also comes with a wrist strap, as shown above, and a gummi cover. The covers edges where the cut-outs were, were more ragged than our official cover, but it was hardly noticeable and did not interfere with play. In summary, I think the controller is a great deal and would be great for children to use, especially because you don't want them handling and breaking your very expensive equipment. We have had fun using it as a family and it has worked very well so far.